It is my privilege that I had the opportunity to do internship in Trust Bank Limited, Dhanmondi Branch. I would like to thank all the people on whom I carry out my internship. I express my deep gratefulness to Mr. Iqbal U. Ahmed, Managing Director; Mr. Ishtiaque Ahmed Chowdhury, Deputy Managing Director & Mr. Shahud Ahmed, SVP & Head of HRD for selecting me to do internship at Trust Bank Limited, Dhanmondi Branch, Dhaka, Bangladesh. I am grateful especially to Mr. Md. Mozakkerul Islam, AVP and Manager; Mr. Mohammad Mostafa, AVP and Sub- Manager; and all the staffs of this branch for giving me the pleasure of doing internship. My heartfelt appreciation and thanks should reach to Mr. Md. Mosharraf Hossain, senior officer, Mr.Khandaker Abdul Hafiz, Nure Alam khondaker officer who co-operated to collect various requirement supports from various sources & helped me to complete this internship report. I am also thankful to all other officers & all the personnel working at TBL, Dhanmondi Branch for their cordial co-operation and support. Especially, I would like to extend my great gratitude to my department supervisor Mr. Mohammad Maksudul Karim for his guidance and useful comments on the preparation of the report. Today necessity of a Bank as a financial institution is undeniable. A country is financially rich when it has modern financial institutions of its own. These institutions play a vital role in the field of financial stability of a country. Banking sector is one of the stable financial institutions of a country. Due to Globalization and Technological changes, the banking business has become very competitive now a day. All banks are competing to give effective real time service to their customers. For giving friendly service to the customers they need experienced and well-educated working force. The overall approach of the report is a Descriptive one as it goes into the depth of service quality of Trust Bank Ltd. Here both primary and secondary information were used. Interview was the basic techniques comply to collect primary data from any people within the organization. Information about the varieties of activities within the Correspondent Banking Department was collected through interviewed. Among the secondary sources to collect data regarding the company’s performance over the past six years are Publications, Annual reports of Trust Bank Ltd., Different circulars and papers of Trust Bank Ltd, Term papers of TBL Training manuals, Guidelines for Foreign Exchange Transactions, General Banking Operation manual, Banking Lecture sheet within the organization helped me to gather data about the organization. The report contains six chapters. The first chapter of the report describes the introductory words of the internship report in which Introduction of Topic, Rationale of the Study, Objective of the Report, Scope of the Report, Methodology, Activity Schedule & Limitations. The second chapter contains the Background of “Trust Bank Ltd.”, Organization Structure of “Trust Bank Ltd.”, Vision of “Trust Bank Ltd.”, and Mission Statement of “Trust Bank Ltd.” In third chapter, it contains the Topic Analysis and Description. Based on the study, findings in different departments of the bank have come in the chapter four. In general banking department, the banking procedure is not fully computerized, cash counter is congested, service of remittance section is not as prompt as the customers demand and introducer is one of the problems to open a new account etc. The loans and advance department takes a long time to process a loan. Different Problems, suggestions, recommendations have come at the end of the report. The Problems findings during the three-month long internship period & suggestions are given from observation, comparative analysis, strategic point of view etc. To increase the efficacy in customer service Trust Bank Ltd. should try to develop the process of providing services. Trust Bank Ltd. has passed a long way since it is providing services. Already it has earned a strong positioned in the field of customer service. To continue to hold the position and be perfect in this sector it will have to keep more and more attention to the customer retention and development. Generally by the word “Bank” we can easily understand that the financial institution deals with money. But there are different types of banks such as; Central Banks, Commercial Banks, Savings Banks, Investment Banks, Industrial Banks, Co-operative Banks etc. But when we use the term “Bank” without any prefix, or qualification, it refers to the ‘Commercial banks’. Commercial banks are the primary contributors to the economy of a country. So we can say Commercial banks are a profit-making institution that holds the deposits of individuals & business in checking & savings accounts and then uses these funds to make loans. Both general public and the government are dependent on the services of banks as the financial intermediary. As, banks are profit-earning concern; they collect deposit at the lowest possible cost and provide loans and advances at higher cost. The differences between two are the profit for the bank. A company can increase efficiency through a number of steps. These include exploiting economies of scale and learning effects, adopting flexible manufacturing technologies, reducing customer defection rates, getting R&D function to design products that are easy to manufacture, upgrading the skills of employees through training, introducing self-managing teams, linking pay to performance building a companywide commitment to efficiency through strong leadership, and designing structures that facilitate cooperation among different functions in pursuit of efficiency goals. Trust Bank Limited pursues decentralized management policies and gives adequate work freedom to the employees. This results in less pressure for the workers and acts as a motivational tool for them, which gives them, increased encouragement and inspiration to move up the ladder of success. Overall, I have experienced a very friendly and supporting environment at Trust Bank Limited, which gave me the pleasure and satisfaction to be a part of them for a while. While working in different departments of this branch I have found each and every employee too friendly to us to cooperate. They have discussed in details about their respective tasks. I have also participated with their works. Internship program is essential for every student, especially for the students of Business Administration, which helps them to know the real life situation. For this reason a student takes the internship program at the last stage of the degree, to launch a career with some practical experience. As a Complete fulfillment of Internship Program introduce the students with the real life business situation. To make a bridge between the theories and practical procedures of day to day Banking operation. To assess the decision undertaken by the top-level management to keep the rein with the competitiveness of the market. Determining the drawbacks of the existing system. This internship report covers all the trade related products handled by the “Trust Bank Ltd.” such as Foreign Exchange, Cash Dept., Dispatch, Account Opening, Remittance, Accounts, Administration and Loans & Advances etc. This report has been prepared through extensive discussion with bank employees and with the customers. While preparing this report, I had a great opportunity to have an in depth knowledge of all the banking activities practiced by the “Trust Bank Ltd.” It also helped me to acquire a first hand perspective of a leading private Bank in Bangladesh. Interview was the basic technique complied to collect primary data from any people within the organization. Information about the varieties of activities within the Correspondent Banking Department was collected through interviews. Data regarding the types of product offered to the clients and the descriptions for each of those products were gathered through interviews. Besides, on-the-job experience has also helped me learn quite a few things about the Correspondent Banking Department and the organization as well. Transaction in foreign Exchange, Principles & Practice (By M.R. Sinha), Guidelines for Foreign Exchange Transactions, General Banking Operation manual and Lecture sheet within the organization helped me to gather data about the organization. Data have also been collected by going through different circulars issued by the head office and Bangladesh bank during the tenor of the internship. The performance evaluation of the TBBL has been conducted based on the trend analysis and ratio analysis. Trust Bank Ltd. having a spread network of 20 branches across Bangladesh and plans to open few more branches to cover the important commercial areas in Dhaka, Chittagong, Sylhet and other areas in 2006. The Bank sponsored by the Army Welfare Trust (AWT), is first of its kind in the country with a wide range of modern corporate and consumer financial products. Trust Bank Ltd. has been operating in Bangladesh since 1999 and has achieved public confidence as a sound and stable Bank. Trust bank limited recently at the end of the year 2006 changed their name from “The Trust Bank Limited” to “Trust Bank Limited” and also changed their logo to bring the bank more closer to the general public. The bank has plans to invest extensively in the country’s industrial and agricultural sectors in the coming days. The bank has participated in syndicated loan agreement with other banks. Such participation would continue in the further for greater interest of the overall economy. The bank is keen to constantly improve its services to the clients and launching new & innovative products to provide better services towards fulfillment of growing demands of its customers. Army Headquarters, Dhaka Cantonment, Dhaka. 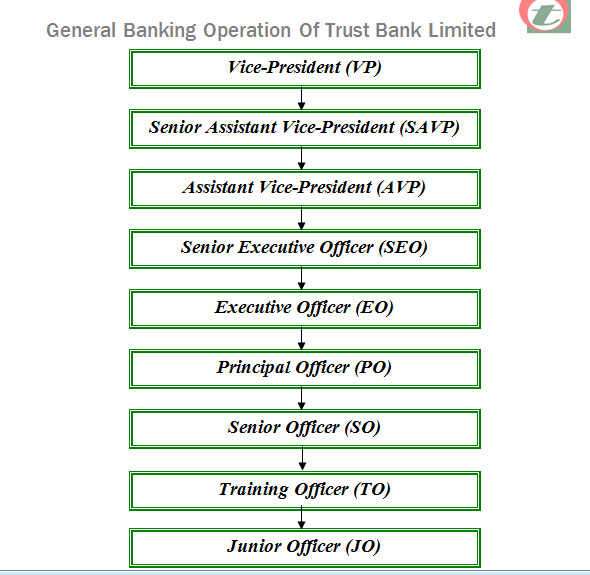 Organizational Structure of Trust Bank Ltd. Achieving sound and profitable growth in Assets & Liabilities, with focus to maintain non-performing assets at acceptable levels. To be the preferred employer among Banks in Bangladesh. ØOpening of Cash: Beginning balance is used to start daily transaction. Payment is made through clearing house. In this case the parties are account holders different banks. The clearing-house in Bangladesh bank makes the clearing tasks in working day where the representatives of every scheduled bank are present there to collect their own banks’ cheque. 3. Also the vouchers are made reversal after returning of cheque i.e. Bills lodged debited and Bills for collection credited. 1. The account information of a client is a secret matter. 2. Bank will not disclose it to unauthorized persons. Summation is nothing but the sum of the debit and credit sides. Now using computer automatically does it. After opening an account if no transaction is made within 6 (six) months, then it is known as dormant account. It is also like the above account. The account is not operating by the client for a long time/3 years. The client himself gives this type of instruction. Account holder instructs his bank not to make payment from his account before further instructions. Due to unavoidable circumstances like burned or lost cheque, the client will make an application to the branch manager to stop all payments from his account and the will immediately freeze the particular account. Bank will give statements if the account holder wants it. This statement will be about the amount consists in account / the latest balance amount in the particular account. Ø Issue and payment of Pay Order, Pay Slip, Demand Draft, SDR etc. Ø Internal and local collection of cheque and bills. It is an order from the issuing branch to the drawee bank / branch for payment of a certain sum of money to the beneficiary. The payment instruction is sent by telephone and funds are paid to the beneficiary through his account maintained with the drawee branch or through a pay order if no account is maintained with the drawee branch. No charge is required for TT. Sometimes customers use demand draft for the transfer of money from one place to another. It is must need for sending money out side Dhaka city. For getting a demand draft, customer has to fill up an application form. The form contains date, name and address of the applicant, signature of the applicant, cheque number (if cheque is given for issuing the DD), draft number, name of the payee, name of the branch on which the DD will be drawn and the amount of the DD. The form will be duly signed by the applicant and by the authorized officer. TBL charges 15% commission on the face value of DD as service charge. Shanchaya patra is received from Bangladesh bank (BB). People purchasing these bonds by depositing money in this branch and payment are made on maturity to customers from this branch only. Every transaction is reported to Bangladesh bank. In case of issuance, report to be reached to BB within 48 hours, otherwise penalty is imposed. Money is realized from BB after making payment to customer. Duration of this Shanchaya patra is 5 years. Any person who purchase this Shanchaya patra can withdraw his/her interest only after 5 years at the time of maturity along with capital. Any single individual can buy Bangladesh Shanchaya patra for up to TK. 50 lac. And jointly can buy for up to TK.1 Crore. Interest Rate: 12.00% After 5 years. Duration of this Shanchaya patra is 3 years. Any person who purchases this Shanchaya patra can withdraw his/her interest in every 3 month but capital can be withdrawn after the maturity period. Any single individual can buy 03 MPB Shanchaya patra up to TK. 50 lac. And jointly can buy for up to TK.1 Crore. After every three (03) month 2,875/= Tk. will be given against 1 Lac. Taka. Duration of this Shanchaya patra is 5 years. Any person who purchases this Shanchaya patra can withdraw his/her interest in every 3 month but capital can be withdrawn after the maturity period. Any single individual can buy Pensioner’s Sanchaypatra up to TK. 30 lac. After every three (03) month 3,125/= Tk. will be given against 1 Lac. Taka. Issuance of Duplicate Instrument Tk. 100/- per instrument plus stamp charges for indemnity at actual. SOURCE: From interview with the In-charge of remittance department of Trust Bank Ltd, Dhanmondi Branch. Payment of Pay Order: The pay order is presented to the bank either through clearance or for credit to the client’s account. While payment, relative entry is given in the pay order register with the date of payment. Ø Balancing at the end of the month. A bank has to maintain different types of accounts for different purposes. Trust Bank limited (TBBL) offers the general deposit products in the form of various accounts. Money will be withdrawn through cheque. Withdrawal cannot be more than twice a week and generally the amount will not be more than 25% of the balance available, subject to maximum Tk. 20,000.00.
for the maintenance of the account. book issued by the bank. For FDR minimum period is 01 month and maximum period has no limit. FDR may be joint or individual. After maturity period the customer gets the interest plus principal back. Succession Certificate: Court mentioning, who will get & what portion. Death Certificate: The payee must make an application including the above documents. The branch will forward it to the head Office. It is very important to note that in these cases, the bank have to be very careful. Some FDR mentions either or survivor, in this case survivor will get the amount. In case of Joint FDR, if one partner dies, then the survivor i.e. who is alive will get the money at maturity or the person’s name in favoring. The FDR account will be renewed automatically on the maturity date. The renewed period shall be the prevailing rate for Fixed Deposits. Tk.1501/- is needed in this case. The bank will have to maintain these indemnity bonds with care in a safe custody or vault. Putting the word “MINOR” after the title of the account (with red color). The maximum number of TSSS account from a single family can not exceed five. The first installment is to be deposited on any date of the month but the subsequent installment is to be deposited by the 10th day. Advance payment of three installments is acceptable. One copy of Passport size Photograph of the account holder is needed to open TSSS. One copy of Passport size Photograph of the Nominee(s) [attested by the account holder] is also required. In the event of failure of to pay installment, the arrear installment(s) should be paid before or along with the next due installment subject to the penalty of Tk. 50.00 for per installment to be paid. In case of premature closure of the account, Tk 100.00 is charged as closing charge. Loan may be allowed up to 80% of the deposited amount but not below Tk 1,00,000.00 against lien or pledge of the same account. Any account can be transferred from any branch to another subject to Tk. 25.00 as Account transfer fee. SOURCE: From interview with the In-charge of FDR department of Trust Bank Ltd, Dhanmondi Branch. The bank lags behind in this project. Other contemporary banks offer the scheme with a maturity period of 6 years that result in the Effective Interest Rate (EAI) of 12.25%. Under the Scheme, the client has to pay a down payment of Tk 7,500.00 or multiple thereof and the bank contributes Tk 42,500.00 or multiple thereof to form a fixed deposit of Tk 50,000.00 or multiple thereof with the bank. The client is allowed an interest rate of 10.00% on that deposit. The client has to pay the amount due to the bank through monthly equal installment of Tk 855.00 or multiple thereof in 6 years. The client is entitled to get the interest on FDR. The TES has been introduced to assist the poor students financially and chronologically. Under the scheme, a student may deposit Tk 10,000.00 for a period of three or five years. After the maturity period he or she may get a lump-sum amount of Tk 13,400.00 (for three years maturity) or Tk 16,000.00 c or he/she may get monthly education allowance of Tk 430.00 (for three years maturity) or Tk 520.00 (for three years maturity) for a period of three years after maturity. There are some more than 500 lockers at the Dhanmondi Branch of TBBL. The lockers are now rented on Security Deposit Basis instead of yearly or monthly rental Basis. The lockers are allotted on most flexible term and meager Security Deposit refundable at the time of closing the locker. The bank offers its clients “Free of Cost” ATM (Q- Cash) card. To be a holder of the Card the person needs nothing but to be a client or account holder of the bank. The bank charges no initial card processing cost or no yearly or monthly service charge. It seems to be a value added service to the clients. Loans and advances Department is the most important department of a bank. Banks borrows money from the public by accepting Deposits from them and then lending it to a borrower for a specific period of time to be repaid with a certain amount of interest. This Dept. is one of the main sources of TBL’s profits. When bank wants to give loans of advances to a borrower, first of all he has to do LRA (Lending Risk Analysis) and when loan amount is 20, 00,000 & above this analysis is compulsory. Because the amount, which is given to, a borrower, actually comes from the public and it is repayable on demand. So, bank has to be careful when giving loans and advances. When banks can not collect the loan amount with interest, they have to bear losses. If TBL agrees to give loans and advances to a borrower after analyzing all sorts of risk, then the borrower writes an application addressing the manager and the amount, business types, securities etc. also are mentioned in the application. After getting the application the manager scrutinizes it for justifying all information whether genuine or not. and after doing this he sanctions the loan. He can also collect the borrower’s credit report from CIB(Credit Information Bureau ) Department of Bangladesh Bank (If the borrower takes loans above Tk. 1,00,000 from any bank, that bank will send this credit reports to the Bangladesh Bank. The manager can sanction specific amount of loans and advances (In this branch it is Tk. 15, 00,000). If the loan amount crosses this limit, then he will recommend it to regional office. Regional manager also has limit for sanctioning loans and advances. If the amount of loans and advances above his limit, he will recommend it to the head office. Then head office will sanction that loans and advances. TBL sanctions loans and advances under certain terms of conditions. When the borrower‘s loan is sanctioned, he is known through intimation/ a copy of sanction letter. If he accepts all terms of conditions, then he has to come within 3, 7, or 15 days whatever mentioned in the sanction letter. In extension of bank credit, nothing is more significant than selection of borrower. While choosing a borrower, bank must study three things: Character, Capacity and in Capital or in other words Reliability, Responsibility, Resourcefulness of a party. Loans up to Tk, 60,000.00 available for purchase of household durable. Tenure ranges from 6 months to 24 months. Bank Provides loan up to Tk. 1,00,000.00 for marriage. Easy monthly installment for a maximum period of 48 months. Loan up to Tk. 3,00,000.00 available for purchase of car. Maximum period for repayment is 48 months only. House Building loan up to Tk. 12.50 lac available for expansion of residential buildings. Easy monthly installment for a maximum period of 07 years. Small loans of Tk. 20,000.00 Tk. 30,000.00 and Tk. 40,000.00 are given to the low-income group for improving standard and quality of living. Trust Bank Limited, with its wide correspondent relationship with major banks in the world is totally capable to meet your needs of foreign currency transactions and foreign trade services. You can open and maintain Accounts in foreign currencies like US Dollar, Pound Sterling, and Japanese Yen and even in Euro with us. With its own Dealing Room, TBL is able to offer competitive Exchange Rate for all major currencies of the world. Welcome & follow-up letter’ as part of additional address verification. Intermediary in case of foreign exchange. So, we can say that the foreign exchange is nothing but the combination of export and import in international platform. If an importer wants to buy goods from foreign countries he has to communicate with the exporter or he may also communicate through indenting firms. To become an importer a person has to get IRC which is issued by CCI& E (Chief Controller of Import & Export). After the agreement between importer & exporter for buying & saling goods, the exporter will send a proforma invoice for the importer. If the importer is unknown about the foreign sellers, he may contact with indenting firms \ agent’s \ dealers. In this case the exporter will send an indent letter for the exporter through the indent firm. Proforma invoice indent letter includes quality; price etc of ordered the goods/ products. An importer is definitely a businessman. As a businessman he must has to pay VAT & TAX to the govt. For opening L\C has to submit VAT & TAX certificate. TBL provides this form for opening a L\C. Importer fill up this form. Importer also has to fill up this form which is provided by TBL. After getting the proforma invoice/indent letter from the exporter, the importer writes an application favoring the manager of the branch where the subject is “Request to open a L/C”. This form includes either the goods \ products will come directly by ship \ air or by transshipment & other necessary condition. ERC (Export Registration Certificate) issued by CCI & E (Chief Controller of Import & Export). Permission from sponsoring Authority such as Board of Investment for industries, Department of Textile for garments etc. VAT (Value Added Tax) & TIN (Tax Identification Number) certificates. The main documents required are Airway Bill / Bill of Lading, Commercial Invoice, Consular Invoice, Packing List, Certificate of Inspection, Certificate and Certificate of origin. This document is a receipt issued by an its for the carriage of goods. Goods are delivered to the consignees when they have identified themselves as the party named in the airway bill. It has two variants: (1) Master Airways Bill (MAWB) and (2) House Airway Bill (HAWB). The Forwarder of the cargo incorporation the L/C terms uses it. § Bill of Lading (B/L). The bill of lading is not the actual contract between the owner of the goods and the carrier, although it does provide evidence of the contract. It is a receipt for goods shipped on board a vessel (for marine B/Ls), and is a document of title to the goods, which are the subject of the contract between the buyer and the seller. This is why a marine B/L can be negotiated. As in a domestic transaction, the commercial invoice is a bill for the goods from the buyer to the seller. A commercial invoice should include a description of the goods, address of shipper and seller, and the delivery and payment terms. The buyer needs the invoice to prove ownership and arrange payment. Some government agencies use the invoice to access customs duties. contains all the necessary information. Documentation that requires a notary stamp or chamber of commerce stamp can be completed by freight forwarder. The export-packing list is considerably more detailed and informative than a standard domestic packing list. An export packing list itemizes the material in each individual package, and shows the individual net, legal, tare and gross weights. Package markings should be shown along with the shipper and buyer’s references. The packing list is attached to the outside of the package in a clearly marked waterproof envelope. The list can be used to determine the total shipment weight and whether the correct cargo is shipped. Customs officials may use it to check the cargo at inspection points. Some purchasers and countries may require a certificate of inspection, which authenticates the specifications of the goods shipped, this is usually performed by a third party and obtained from independent testing companies. If the seller provides insurance, the insurance certificate states the type and amount of coverage. Consular invoice are generally required by Middle East countries issued by the embassy of the importer’s country. A consular invoice allows the importer’s country to collect information on the value, volume, quality, and source of the goods. The invoice is purchased or obtained from the consulate of the country to which the goods are being shipped and must be prepared in the language of that country. Credit is an arrangement whereby bank acting at the request and on the instructions of a customer or on its own behalf to make a payment to or to the order of a third party or is to accept and pay bills of exchange drawn by the beneficiary. In an economy banks play the role of an intermediary that channels resources from the surplus group to the deficit group. So, one of the core functions of Commercial banks is to sanction credit facility to its customers as per requirement. Trust Bank Limited Mission is to actively participate in the growth and expansion of our national economy by providing credit to variable borrowers in most efficient way of delivery and at a competitive price. Bank can lend up to 15% of its capital fund without having any approval from Bangladesh bank. The maximum limit can go up to 100% of the bank’s capital fund. Trust Bank Limited complies with the ceiling set by Bangladesh Bank. Basically Trust Bank offers both funded and non-funded credit facilities. Cash credit is a continuous credit facility usually provided for working capital fund requirements purpose of the customer. Cash credit is generally given to traders, Industrialist for meeting up their working capital requirements. Cash Credit can be given on Hypothecation of goods or pledge. Trust Bank only practices Cash Credit on Hypothecation. A certain limit of credit amount is set at the time of initiation of Cash Credit facility. An expiration date is set, which is not more then one year. The drawings are subject to drawing power. A service charge, which in effect an interest charge is normally made as a percentage of the value of purchases. The primary security of Cash credit facility is stock of goods, which maybe hypothecated to Trust Bank as collateral. Over draft facility is also a continues loan arrangement on a customer’s current account permitting him to overdraw up to a certain approved limit for an agreed period. Here the withdrawal of deposits can be made any number of times at the convenience of the borrower, provided that the total overdrawn does not exceed the agreed limit. Customer can return any amount at any time within the pre-fixed time of the facility. Turn over of an OD facility is the most important phenomenon on which renewal of the facility depends. Over draft facility is given to the businessman for financing working capital requirement and high net worth individual to overcome temporary liquidity crisis. This is a type of over draft facility given by keeping sufficient collateral from the customer. This facility provides specific right to a client to over draw within a pre fixed limit for a certain period of time. SOD is normally granted against the security of tangible asset such Lien of FDR, Bonds, Sanchay Patra etc. Interest charge on SOD is calculated on the basis of the security liened. The common thing is 2.5% spread is kept in charging interest. Interest is calculated on outstanding amount at daily basis. Term loans are given to finance the acquisition of capital asset. Loan agreements often contain restrictive covenant and loan is repayable in accordance to amortization schedule. Collateral is must for term loan. Midterm – this loan facility is extended for more then 1 year but less the 3 year. Trust Bank encourages midterm loan. A letter of credit is a credit line given by a bank to an importer to facilitate both foreign and inland transactions. This is a contingent liability which can be converted to a funded facility incase bank makes the payment on behalf of the importer. A letter of credit can be revocable or irrevocable, restricted or negotiable so on. Trust Bank offers guarantee for its reliable and valuable customer as per requirements. This is also a Credit facility in contingent liabilities from extended for participation in development work like supply of goods and services. Trust Bank receives commission quarterly @ 0.50% of the guaranteed amount. In time of tender bidding either cash or bank guarantee is required in case payment of earnest money. The tender guarantee assures that the tenders shall uphold the conditions of his tender during the period of the officer as binding and that he /she will also sign the contract in the event of the order being granted. Approval of Bank guarantee is given. A guarantee can be converted into funded facility if it is en cashed. If the client is unable to meet up banks demand a loan account is created like Over Draft as Bank is liable to pay to the beneficiary of the guarantee. If Bank guarantee is not used then the beneficiary or party to whom the guarantee was given on behalf of the client will sign on the back of the Bank Guarantee stamp and write the word ‘Released’. Then the facility will be expired as well as banks liability. Bank can lend up to 15% of its paid up capital with out any approval by Bangladesh Bank. If the loan amount is more then 50% of its paid up capital Bank goes for Syndicate loan. Lead bank makes the arrangement. Head office makes facility agreement by bank’s lawyer. All terms and conditions such as security sharing, mode of repayment, covenants of the loan are written on this facility agreement. A loan policy gives loan officers and the bank’s management specific guidelines in making individual loan decisions and in shaping the bank’s overall loan portfolio. One of the most important ways a bank can make sure its loans meet regulatory standards and are profitable is to establish a written loan policy. A goal statement for the bank’s loan portfolio (in terms of types, maturities, sizes, and quality of loans). Lines of responsibility in making assignments and reporting information within the loan department. Operating procedures for soliciting, reviewing, evaluating, and making decisions on customer loan applications. Lines of authority within the bank, dealing who is responsible for maintaining and reviewing the bank’s credit files. Guidelines for taking, evaluating, and perfecting loan collateral. A presentation of policies, and procedures for setting loan interest rates and fees and the terms for repayment of loans. A statement of quality standards applicable to all loans. A statement of the preferred upper limit for total loans outstanding (i.e. the maximum ratio to total loans to total assets allowed). A description of the bank’s principal trade area, from which most loans should come. A discussion of the preferred procedures for detecting, analyzing, and working out problem loan situations. A written loan policy statement carries a number of advantages for the bank adopting it. It communicates to employees working in the loan department what procedures they must follow and what their responsibilities are. It helps the bank moves toward a loan portfolio that can successfully blend multiple objectives, such as promoting the bank profitability, controlling its risk exposure, and satisfying regulatory requirements. character, capacity, cash, collateral, conditions, and control. All must be satisfactory for the loan to be a good one the lender’s (Trust Bank’s) point of view. The loan officer must be convinced that the customer has a well-defined purpose for requesting bank credit and a serious intention to repay. Responsibility, truthfulness, serious purpose, and serious intention to repay all the monies owed make up what a loan officer calls character. The customer requesting credit must have the authority to request a loan and the legal standing to sign a binding loan agreement. The borrower should have the ability to generate enough cash, in the form of cash flow, to repay the loan. This cash flow of borrower can be generated from sales or income, from the sale of liquidation of assets or funds raised by using debt or equity securities. The borrower must possess adequate net worth or enough quality assets to provide adequate support for the loan. The recent trend of borrower’s line of work or industry must be aware of by the lender. The lender should careful about whether changes in law and regulation could adversely affect the borrower and whether the loan request meets the bank’s and the regulatory authorities’ standards for loan quality. A loan procedure starts with a loan application from a client who must have an account with the Bank. At first it starts form the branch. Branch receives application from client for a loan facility. In the application, client mentions what type of credit facility he/she wants form the bank including his personal information and business information. Branch Manager or regarding Officer in-charge of credit department conducts the initial interview with the customer. After receiving the loan application form, the bank sends a letter to Bangladesh Bank for obtaining a credit inquiry report of the customer from there. This report is called CIB (Credit information Bureau) report. This report is usually collected if the loan amount exceeds Tk. 50 thousand. The purpose of this report is to be informed that whether the borrower has taken loan from any other bank or not, if ‘yes’ then whether these loans are classified or not. – Incase of Corporate Client, Financial documents of the company of last three to five years. If the company is new then projected financial data are required. – Personal net worth of the borrower/Borrowers. – In this stage, the Bank will look whether the documents are properly filled up and signed. Credit in charge of the relevant branch is responsible to know about the ins and outs of the client’s business through discussing with him. Bank officially inspects the project for which the loan is applied. Project’s existence, distance from bank office, viability, monitoring cost and possibilities are examined. Any loan proposal needs to be evaluated on the basis of financial information provided by the applicant. Lending Risk Analysis (LRA) is a technique by which the risk of the loan is calculated. Banker must analyze LRA when loan application is above 1 crore. Experienced people of Credit department in Trust Bank do this analysis. It is a ranking whose total score are 140. Among this score, 120 is for Total Business Risk and 20 for Total Security Risk. Obtain vetting or legal opinion on the collateral provided by the applicant, whether those are properly submitted -regular and up to date or else those documents will be asked to regularize by the client. 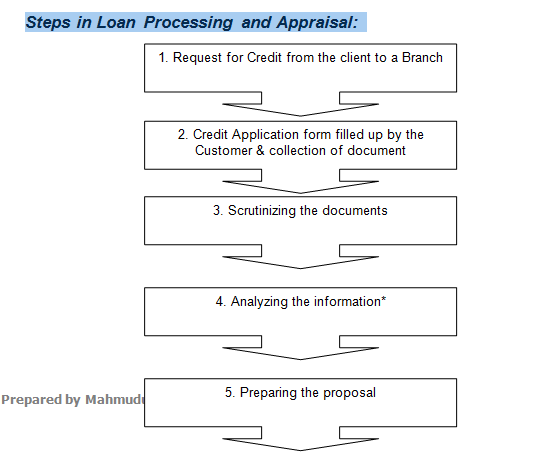 Then come, the processing stage of loan. In this stage, the Bank will prepare a Proposal. The proposal contains following relevant information. If the proposal meets Trust Bank’s lending criteria and is within the manager’s Discretionary powers, the credit line is approved. The manager and the sponsoring officer sign the credit line proposal and issue a sanction letter to client. If the value of the credit line is above the branch managers’ limit then it is send to head office or zonal office for final sanction with detailed information regarding clients, business or purpose of the loan, security papers. After approval by the Credit Committee head office or zonal office gives an approval letter to the branch and branch gives a sanction letter. The client should accept sanction advice with seal, which will prove his agreement with the terms and condition offered by the bank. After the sanction advice, Bank will collect necessary charge document. Charge documents vary on the basis of types of facility, types of collateral. Credit Planning implies estimating first the total lend able resources that are likely to be available within the given period and then allocating the same amongst various alternative uses in conformity with national plan and priorities. Demand for Credit is much more than its supply. Providing credit at right person at right time at right quantity. Getting maximum output as a result of credit allocation. Achieving declared objective such as providing credit to priority sectors. Is the business good enough to ensure regular repayment of my loan? Do the securities cover adequate exposure, if the business fails to produce returns? and Business risk pillar. In this regard, the FSRP authorities have prescribed a total 11 forms, for the bankers for facilitation their decision-making. a) The properties are to be acceptable to the lending bankers for securities. b) Creation of the charge on the concerned properties. 1. Value of property must cover the loan amount with margin. 3. Free from credit restrictions of Bangladesh Bank (if any). Within the credit policy of the bank. There are two types of securities i.e. primary and collateral. Modes of Creation of chares are of different types. These are dependable on the basis of nature of loans and advances and nature of properties for securities. Charges may be of different types like legal Charge, Equitable charges, fixed charges, floating charges etc. When goods and produces are handed over to the lending banker by the trader or manufacturer who borrow against those goods and produces for short term i.e. for working capital. But if any goods and produces are kept with the bank for security purposes will not be treated as pledge. In otherwise it is the Bailment of goods as per Bailment of goods act. In case of Pledge, control and possession of goods and produces will remain with bank but ownership will remain with borrower. There will be a storehouse either of banks or rented for safe keeping of goods. Insurance of pledged goods are compulsory. And all related expenses would be born by borrower. Hypothecation is just opposite of pledge. When a borrower ownership, control and possession of trading goods but legal right and indirect control is created by lending banker for security against short term advances i.e. Equitable charge is created is known as Hypothecation. Just control and possession of trading goods are kept under borrower. In these types of securities lending banker generally asks for collateral securities. This type of mode of securities is allowed only for the case of first class borrowers. When bank create charge on immovable property in the form of mortgage against any lending to the borrower. Therefore a mortgage is a transfer of interest of a specific immovable property. The immovable property means land and the property attached to land but not grass, trees and crops. Mortgage is to be created for securing loan or performing any contract. And there will be a Mortgagor, Mortgagee, Mortgaged Property and Mortgage deed. A lien is defined as the right to retain property belonging to a debtor until he has discharged a debt due to the retainer of the property. Lien may be of two types, General Lien and Particular Lien. A particular Lien confers a right to retain a property in respect of a particular debt involved in connection with a particular transaction. But a General Lien confers a right to retain goods not only in respect of a debt incurred in connection with a particular transaction but also in respect of any general balance arising out of the general dealing between two parties. Banker’s Lien is defined as an implied pledge. An ordinary lien does not imply a power of sale, but a pledge implies a power of sale. A banker’s right of sale is generally regarded as extending only to fully negotiable instrument, with regard to other securities. The price of a loan is the “interest rate” that the borrowers must pay to the bank; in addition to the amount borrows (principal). The price or the “Interest rate” of a loan is determined by the true cost of the loan to the bank (base rate) plus profit/risk premium for the bank’s services land acceptance of the risk. These three components add-up to the bank’s “base rate”. Administrative cost = Deposit as well as Loan administrative cost. Cost of capital = Return on capital or the Rate of Return investors would expect to receive from their investment in a bank. Risk is the measurable possibility of loosing or not gaining value. The Primary risk of making loan is Repayment Risk, which is the measurable possibility that a borrower will not repay their obligation as agreed. The Price a borrower must pay to the bank for assessing and accepting the risk is called the risk premium. Since past performance of a sector, industry or company is a strong indicator of the future performance, risk premium is generally based on the historical, quantifiable amount of losses in that category. Interest Rate Charge = Base Rate + Risk Premium. 1. Agriculture loan including raw jute 11.00% P.A. 2. Term loan (project loan) 15.00% P.A. 3. Working capital loan (except jute) 16.00% P.A. 4. Export loan (packing credit, export cash credit) 7.00% P.A. 5. Commercial loans (cash credit, hire- purchase, LTR, IBP etc.) 15.00% P.A. 7. Small & cottage industry loan (Without subsidy of Bangladesh Bank) 15.00% P.A. 8. Loans under various credit schemes such as consumer’s credit, small loan, Doctor’s credit, rural development credit etc. 15.00% P.A. SOD against financial obligation (PSP, BSP, ICB unit certificate etc) 14.00% P.A. SOD against deposit of various savings instruments of MBL 15.00% P.A. SOD against shares / work order / export bills / quota etc 15.00% P.A. Statements are sent to Bangladesh bank on monthly, quarterly, half yearly and yearly basis. These statements are based on advance and inland Bill purchase/Discounted, Statement over due advances, CIB Statement, Statement of Credit, and Monthly Statement of deposit, Monthly Statement of Bank Loan & advances and other as per central bank time-to-time requirement. q Profit and Operating Results: The bank earned as operating profit Tk. 296,261,558 during 2005 after all provisions including the 1% general provision on unclassified Loan & Advances. 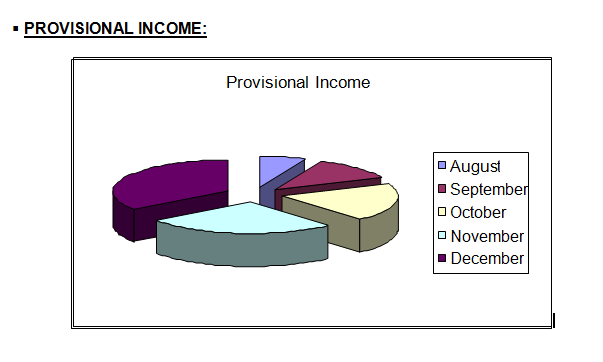 Provision for income tax for the year amounted to Tk. 105,000,000 resulting into a net profit after tax of Tk. 121,286,368 million. recording an increase of 36.39% in comparison with Tk. 9,314,952,180 as at December 31, 2004. The significant growth in deposit enabled the Bank to expand its business, performing assets and also had an impact on the profit position of the Bank. Advance: The Bank Loans & Advance portfolio also indicates an impressive growth. Total Loan and Advances amount to Tk. 9,738323,349 in 2005 against Tk. 6,804,448,553 in 2004 and the growth being 43.11% TBL’s Advance portfolio is well diversified and covers a wide range of businesses and industries. The sectors financed include Manufacturing, Trading, Construction, Transport, Agriculture, Fishing & Forestry, Information Technology, and Consumer Credit amongst others. Advances constitute the most significant indicator of the health of a Bank. The Bank has formulated its policy to give priority to SMES (Small and Medium Enterprise) and at the same time the Bank is financing large-scale enterprises through consortium of Banks. The Trust Bank Limited is committed to maintain a very high quality of assets. Close monitoring and efficient asset management has resulted in minimal creation of classified loans to total Loans and Advances. International Trade constitutes the main stream of business activities of the Trust Bank. 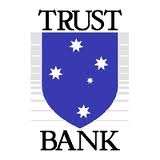 Trust Bank Limited offer a full range of trade and services namely, issue, advice and confirmation of Documentary Credit; arranging forward exchange coverage; pre-shipment and post-shipment finance; negotiation and purchase of export bills; discounting bill of exchange; collection of bills, inward and outward remittance etc. Import Business: The Bank established Letter of Credit amounting to Tk. 35,726,574 during 2005; showing a growth of 16.83% over the volume of Tk. 30,578,688 in the year 2004.
q Foreign Correspondents: The number of foreign correspondents and agents of Trust Bank Limited is increasing day by day. The Bank has maintained excellent relationship with leading international Banks and has successfully established credit lines with major Banks to support global Foreign Trade Business. Rent, Taxas, Insurance, Electricity, etc. 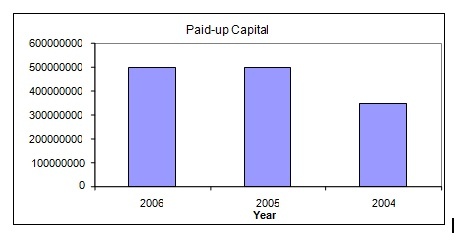 The Return on Equity of The Trust Bank has decreased as because its capital is increase over this period 2004 to 2005. It will increase the bank’s access to new capital. The main reason of this increase is their net income. We can see a decrease in the Return on Asset of The Trust Bank over the period 2004 to 2005. It measures that the management should utilize the real and financial resources of the bank to generate return. A DU point analysis can be done by breaking down the ROE & ROA into different parts. employ assets effectively to generate revenue. Equity multiplier of The Trust Bank has decreased means that the bank became more levered during the period. Most of their assets are financed through debt. Here, the Net Interest Margin shows a increment over the period. So, total interest income increased largely in comparison with total interest expense. So, The Trust Bank has decreased their provision for loan loses over the period 2004 to 2005, means that their loan/ credit (asset) quantity become lower over the period, and thereby their risk has increased over time. These loan ratios indicate the extent to which assets are devoted to loans as opposed to other assets. The loan ratio of The Trust Bank has increased over years, means most of their assets are in the form of loan and the ratio is increasing continuously. Of course, The Trust Bank has become more risky over the period. After analyzing all these financial ratios, I can conclude here by saying that the performance of The Trust Bank LTD. has become somewhat satisfactory over the period of 2004 to 2005. Their liquidity position is good. They should provide more loans. Their asset mix is not satisfactory enough. They should improve their performance. They should provide more loans & advances to less risky sector in-order to improve their net income and build strong equity based. Our accounts with them. This means TBL maintains its accounts in different banks outside Bangladesh for reimbursement in foreign exchange businesses. Their accounts with us. This means different banks outside Bangladesh maintain their accounts in TBL for reimbursement in foreign exchange businesses. Your accounts with me. When two banks from one country maintain their A/C’s in one bank outside their country. 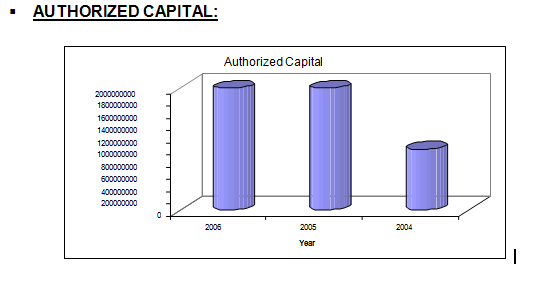 The authorized capital of the bank was Tk 100.00 crore in 2003 which was increased in subsequent year 2004 by twofold. In 2005 and also in 2006 the authorized capital stands for the same worth of Tk. 200.00 crore. It is due to the bank’s future expansion philosophy and to keep rein with the market competitiveness. The equity of the Shareholders in 2003 was Tk. 454,301,755. In 2004 it has increased by 91.65% as the total of Tk. 870,685,941. In 2005, it was amounted Tk. 991,972,309, being the increase of 118.38% on that of 2003. It is due to the expansion of the bank and the financial more strength of the army Welfare Trust. In 2003, the Statutory Reserve of the bank was Tk. 24,604,405 which stands at Tk. 67,881,642. It was an increase by a gross amount of Tk 43,276,837 or by 175.88% on that of 2003. In 2003, the statutory reserve stands at Tk 113,138,916, an increase by 359.83%. It is due to the rise of the bank’s overall capital and the regulation under the Banking Act 1991 to keep a certain percentage of share capital or profit as statutory re serve. Fixed assets after deducting accumulated depreciation were in 2003 Tk. 61,369,226, in 2004 Tk. 83,971,729 and in 2005 Tk. 110,616,082. It is because of the expansion of branches during that period. Cash in hand and with Bangladesh Bank and Sonali Bank. Balance with other banks and financial institution. Money at call and short notice. Total Assets of the bank was Tk. 7,858,833,009 in 2003 and Tk.12, 085,815,830 in 2004- a 53.786% increment. The value of total assets stood at Tk. 14,807,905,231 in 2003-a 88.42% increase. It shows the advancement of the bank responding the market. 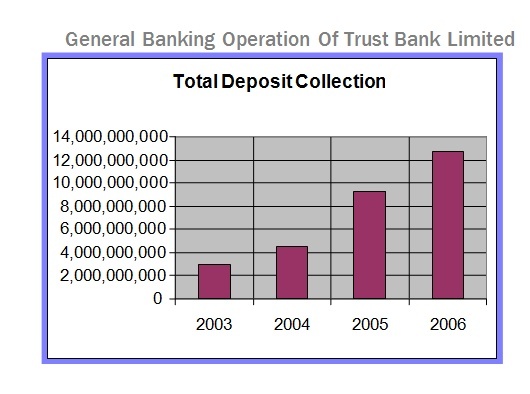 The pictorial graph and the subsequent numerical figure show that the deposit collection was more than double than that of 2003. In 2005, total deposit was increased by 40.5% than the deposit of accumulated in 2004. So it is vivid from the viewpoint of deposit collection the performance of the bank in 2004 was far better than 2005. 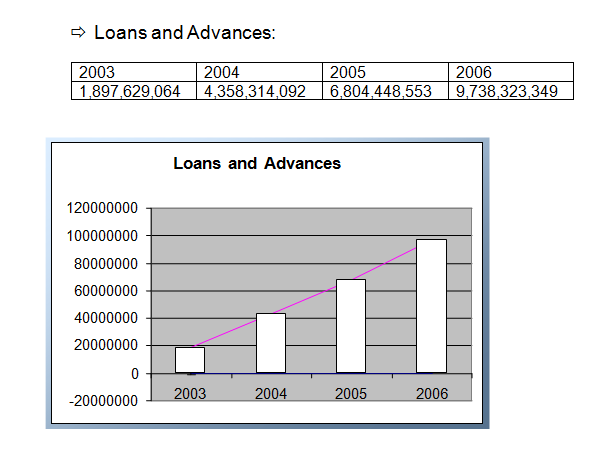 The graphical and numerical presentation depicts that loans and advances increased by 54.6% in 2004 and 116.82% in 2005 (taking 2003 as the base year). The growth level of loan and advances is about the same rate both in 2004 and 2005. Overall investment increased by 69.79% in 2004 being a total of Tk 3,220,777,070. But in 2005 the value of investment decreased by Tk 772,823,292 or 24% in comparison with that of 2004. In this competitive market this bank earned Tk. 1,444,597,936 in 2005 which is 38.06% greater than the gross income of 2004. It clearly indicates that this is a growing organization and will continue its success in the coming years. 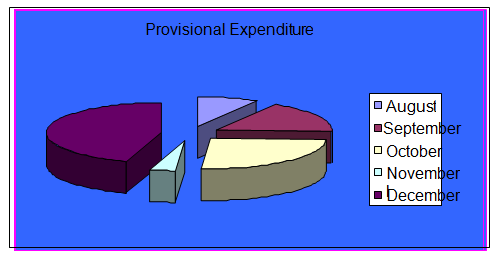 Here the ratio of expenditure in 2005 has decreased than that of previous year. But the percentage of expenditure has increased @ 46.79% in 2005 which is more than the percentage increase in the Gross revenue. From the information mentioned above a comment can be made that Year-2004 was its “Golden Age”. But in 2005 it also increased its “profit before tax” and gained a honorable position in the banking sector. From the above mentioned statement, it is vivid that the net profit touches the peak in 2004 by accomplishing a stunning rise of 217.68%. But the journey of increasing profit can=me backward in 2005. The After Tax Net Profit went down by 43.95% in 2005 comparing the profit of 2004 the Provision for Tax played a significant role in this respect. 1.40%. So it can be said that investment was not efficiently made. Concentration should also be given to the Capital, Deposit and Credit Management. 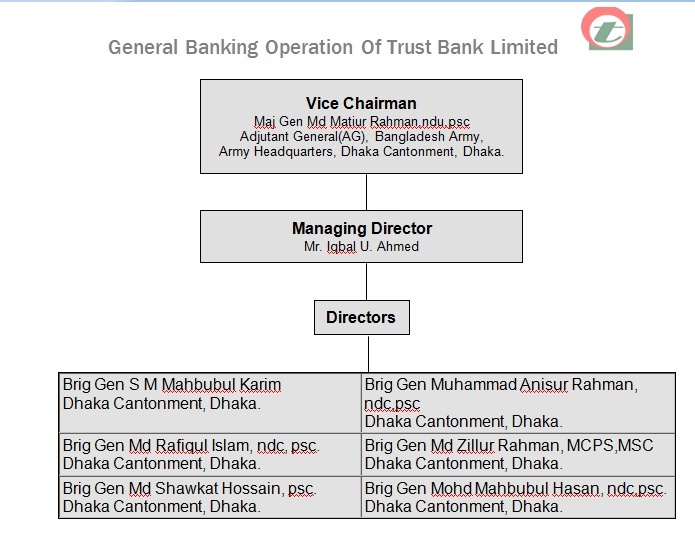 Trust Bank Limited started its journey at Dhanmondi, Dhaka in 2003 recognizing its location at Bangladesh Rifles (BDR) Gate no 04, Peelkhana, Satmosjid Road, Dhanmondi, Dhaka. Currently the Dhanmondi branch conducts its operation under the management of Mr.Md.Mozakkerul Islam, the AVP and Manager of the branch with a staff of 31 (including 4 office help). The ratio between women and men personnel is above 2:1 i.e. among 27 employees 19 are women and the rest are men. The women empowerment in that way is obviously praiseworthy. From the above table and graph, it is found that in the year 2006, the overall income of the branch is satisfactory in comparison to the year 2004 and 2005.It implies in the year 2006, the bank was done good business. income went down by 3.96%. Proper concentration should be given to the consistency of income. From the Table above, it is found that operating expenditure increased highly in May. The rise in expenditure is somewhat inconsistent with the previous months. Care should be imparted on the minimization of the operating expenditure. Profit is rise of 381.75% of the year 2006 in comparison of the year 2004-05. The overall profit or loss of the branch is good in the year 2006, which shows that the bank is done good business in this year. Comment: From the above Table some conclusions can be drawn about the budgetary achievement of Dhanmondi Branch. Growth of export and import of the branch has been improved but deposits, advances and profit has been declined. In response to budget deposits, advances, export and import target have not been achieved. On the whole, the performance of the branch is satisfactory. Trust Bank Ltd. is the pioneer of private sector banking business. The customer service is very much impressive than of other financial Institutions. Although, I have no idea about other branches of TBL, But in particular, TBL Dhanmondi branch is a good example of better Customer service. The decision undertaken by the management is sometimes self centered i.e. the market competitiveness is often ignored to give priority on their own capability and resources. The marketing strategy adopted by the bank is effective but not efficient. 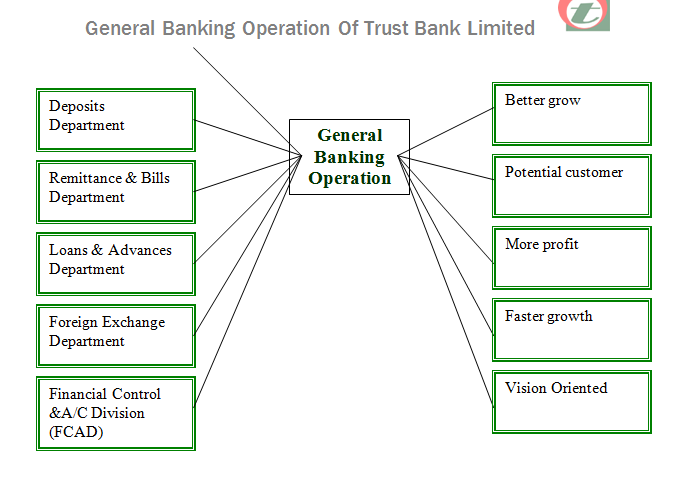 General people take time to index Trust Bank; Most of the time they disregard it with the Mutual Trust Bank. The management have hardly overcome the notion-“A bank of armed forces at cantonment” i.e. the banking concept is yet to be universalized. Top management guides to its subordinates when needed but the specialization of the personnel on a particular task is not ensured. 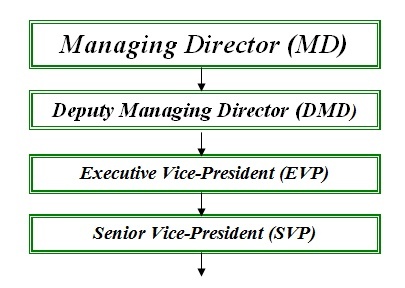 It has been found that executives are transferred from one branch to another without ensuring other executives being acquainted with the task. Computerization is speeding up the performance of the organization but the software used by the TBBL-“FLORA” is not updated & so fast. It is easy to handle but contains some flaws. The profit earned by the bank in the previous periods is satisfactory but the deposit mobilization and accumulation is not as targeted. The expansion process of the bank has little match with the modern pace of globalization. Despite being stoned in 1999, the bank has only 27 hands now. The products offered by the TBBL are very limited in range comparing to the contemporary banks. The clients can hardly find the best alternative of particular products. Western Union Money Transfer etc. are very popular. Less interest payment by Trust Bank Limited than others in some accounts. Still the bank is not fully computerized. So, manual registers are used in some cases. There is no color printer in this branch. On line banking is not introduced in Trust Bank Limited. Giving better customer service, Full computerization of all activities, Supply of new PC’s in place of old one, sufficient numbers of PC needed for proper working. Interior decoration should be introduced for clients comfort. The management should impart more imphasis on the advertisement of the bank in different electronic and printing media. The Basic goal of the advertisement should be firstly to make people know and understand that the bank is universal one and permits any one’s access. Full computerization of the branch will less the time consumption of manual process. So, that the employees will able to perform well at the end. The spread out mechanism of the bank should be faster and progressive as well. Being established in 1999, the bank has established only twenty seven branches in eight(8) years. The mode of extension is much slower than other contemporary and equivalent banks. On line banking should be introduced to compete with multinational banks. The management should care for the personnel more. At the recruitment stage, it should go for the best candidate and after selection the personnel should be allowed with proper opprtunity to be expert on particular task bestowed on them. More products of varied interests should be introduced for the diversified client group. To enhance the image of the bank and to assume social responsibility, the bank should engage itself to various social programs like Scholarship to poor but meritorious students, Empowerment of the children in abject poverty, Compaign against dowry and other social evil etc. Trust Bank limited pursues decentralized management polices and gives adequate work freedom to the employees. This results in less pressure for the workers and acts as a motivational tool for them, which gives them, increased encouragement and inspiration to move up the ladder of success. The profit earned by the bank is used to the welfare activities of the Trust. The economic service of the bank is open to all caste and class of people. The bank is formatting and accomplishing various welfare projects and activities for the socio economic infrastructural development of the country and the active participation to the up gradation of the comparative feeble class of the society, in stead of accumulating profit. It has also been linked with many foreign banks to facilitate the foreign currency transfer by the members of armed forces working in the UN and emigrant Bangladeshi. The report is aimed at studying and understanding the various services offered by TBL to its clients. In addition, the report also studies how Trust Bank Limited has maintained growth in its general banking business by maintaining and enhancing its relationship with its clients. The success of Trust Bank limited is largely credited to its friendly, co-operative approach, understanding the special banking needs of each and every client and concern for the benefits and welfare. From the beginning, the prime objective of Trust Bank limited was to increase capitalization, to maintain disciplined growth and high corporate ethics standard and enhance the health of the share holders. Its customer service is very much impressive than of other financial institutions. Their effective strategy, time demand offerings, up to date rules and regulations to cope with international market and their friendship customer services easily impress the clients. So, now Trust Bank limited is in leading position in Financial Institutional sectors in Bangladesh. The financial performance of the bank in recent years is pretty well. Moreover, any laxity in operational ground can considerably be compensated through the cordial services provided by a staff of talented officers or employees. Ø Guidelines for Foreign Exchange Transactions.